It is with great sadness that we have to report the death of our founder and long-serving Chairman, Maurice Pickering, on 22nd January 2008. In 1985 Maurice was part of a group headed by Councillor Peter Pitt that was concerned at how funding cutbacks at Harrow Council were being reflected in a decline in the management and therefore quality of the built and natural environments. This group founded the Mayor’s Trust, which became the Harrow Heritage Trust. Maurice, with the help of Steve Woad, a council officer, Peter Peretti, warden of Bentley Priory Nature Reserve, Betty Brown of Bentley Old Vicarage Nature Reserve and others created the Nature Conservation Forum as the component of the Trust concerned with wild and open spaces. A structure for the Forum was set up that has survived largely unchanged to the present: each open space under the Trust’s care had one or more dedicated wardens, while Maurice as chairman not only joined the wardens as they chopped and hacked at encroaching scrub on the various sites but also worked tirelessly to attract interest in green issues, fight development in the green belt, and generally keep up the spirits of the other members of the Trust. He was determined that the Forum work primarily with spade and lopper rather than pen and ink, and to this end held only three Forum committee meetings per year, a system that worked in large part due to his detailed memory of correspondance, decisions and Council documents dating back tens of years. He was also a driving force within the larger Harrow Heritage Trust, using his knowledge as a prominent and respected architect as part of the team that judged local buildings in an annual award scheme. The spirit of the times slowly caught up with Maurice’s vision. Maintaining and increasing biodiversity is now a stated aim of all London boroughs, and Harrow now has a biodiversity officer who can encourage and implement the green agenda within the Council. To increase the awareness of Harrow’s open spaces among the borough’s young people Maurice campaigned long and forcefully for an ecology educational facility to host school trips and other educational events. After, in Maurice’s words, “gathering dust somewhere in the Civic Centre”, the project has recently been revitalized: Councillor Camilla Bath has confirmed that there is already £100,000 earmarked for this project from section 106 monies, while the public consultation on the fate of the Bentley Priory Ministry of Defense site specifically raised the idea of an ecology centre either within the historic house or as a separate building. With ill health encroaching Maurice stood down as Forum chairman in May 2006. He was and will be sorely missed, but his legacy, in the form of a still green northern horizon to gladden the hearts of all in Harrow, is there for all to see. We have had three more BTCV visits this winter. 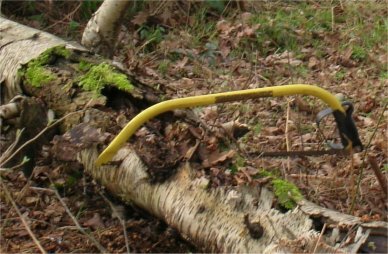 We have concentrated on clearing encroaching bramble from some of the paths and recreating one of the rides that had been swallowed by birch and gorse. The ‘fruits and colours of autumn’ event in November was well attended About 15 people turned up and as the weather behaved itself we enjoyed the two hour walk. Margaret even found a Scarce Umber moth to show everyone. Dave Corby reported to the latest Forum meeting that £10,000 had been allocated for the new car park. After the engineers had been on site it would go to planning in February with a view to delivery in March. Features will include a height barrier, a gate that would be locked every day, bollards in the scrub and drop posts. Anna Cohen reported to the Forum that funding had been applied for from Transport for London for mending the damaged bridge on the London Loop link. She was still waiting to hear from them. As stricter parking restrictions had been introduced on Kerry Avenue due to problems related to people parking there for Wembley Stadium, future events would start from Dennis Lane. Work had continued on leaf clearance throughout the Autumn and two fallen trees have been cleared. It was agreed that D. Corby should meet with B. Brown at the site to see exactly where the problem was occurring regarding the grass cuttings from the Cemetery. Parks Dept. will also look at the path resurfacing issue as this was the third year that a request to deal with it had been put in and the path was gradually getting worse. John Grocott, who has worked at the site for many years, was officially retiring as a warden at the Bentley Old Vicarage AGM. It is 21 years ago that this site became nature reserve and we will be celebrating this alongside our other events. Hopefully we will be able to produce a new leaflet this year. New lighting has been installed by Blackwell Hall as part of the Police Safer Neighbourhood initiative. This did not impinge on the wilder parts of the site. The fence facing Wood Lane has been repaired by BTCV very satisfactorily. A day of clearance worked has been carried out by the Herts and Middlesex Wildlife Trust on the dyke and they had indicated that they would be back in January to clear up. This had not happened so far possibly due to the wet conditions which would make any burning difficult. Both Anna Cohen and Claire had sent emails to them about the matter. Bird boxes will be up in the next few weeks but there was some hesitation about including an owl box due to rumours of shooting. We have contacted a bat expert but it is too early in the year for surveying to begin. The issue of the lighting on the golf range will be considered. The lights may not in fact be detrimental to bats although they could be to other wildlife such as owls. There had been some fly tipping on the site but it was reported that it had been very promptly removed by the Council and we would like to thank them for this. It was reported that there is a tree down which is blocking access to the lake. We have arranged with British Legion Fishermen to remove it. We also had to remove, over a couple of days, a huge amount of rubbish left by a rave party in the Guide field. It was agreed that the Belmont line had an important part to play as a green linear corridor and should be retained as a reserve. Wheel chair and bicycle access had been provided from the Belmont Circle car park. The site was cut once a year in July. D. Corby indicated that if fly tipping was a problem the Council could help with this. I am pleased with the work carried out by the Council using the side flayer. Work had been more difficult recently because of the rainfall and the weather may have adversely affected the barn owls. Elizabeth Stainthorpe and I have been carrying out the British Trust for Ornithology survey at the reserve. Work has continued on clearing litter and leaves, cutting grass and clearing scrub. The ditch has been cleared and nettles cut down. The pond filled to overflowing on the 11th January this year compared with December 2006 previously indicated that there was a deficit in the water table to be made up. We are still waiting for the new post and rails to be fitted. This was an issue which would be looked at by D. Corby. Work days have been planned for the coming months. Two working parties had already taken place and areas had been cleared which would benefit flowers such as betony and wood sage. Two more working parties to tackle secondary wood clearance were planned. Volunteers who had previously worked on the reserve had been contacted and three of them had come to a working party. An old, very muddy path had been blocked off at both ends so that the new dryer path would be used. As part of the London Heathlands’ Heritage Project a lot of heather sowing had taken place on selected prepared ground. I am completing the biological records which will then sent to Anna Cohen. It was reported that replacement litter bins and new dog bins were needed. The picnic tables also needed replacing. Steve Bolsover had written to Councillor Marilyn Ashton regarding cat proof fencing but had not heard anything so far. I’ve put this item in as I’ve been made aware that not everyone knows about the BTCV. This organisation offers volunteers the chance of learning a wide range of environmental tasks. They are based in Kings Cross and for five days of the week minibuses full of volunteers depart to all points of the compass in London to help out in nature reserves. We have to book our days a few months ahead so that they can organise their diverse programme.